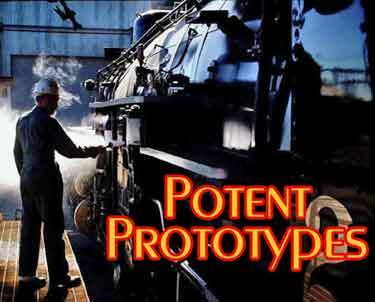 Stories about modelable real-life rail lines (called “prototypes”) are among the most popular pages we run. Here are a new group, and this time we’ve tried to include some ideas on how they might be converted to small models. We hope you find some inspiration here! 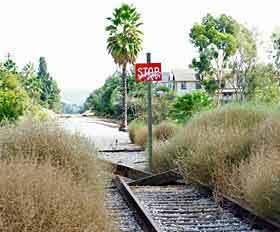 One of the best-known individually owned railroads in the U.S. is the Grizzly Flats Railroad of Ward Kimball, an animator for Walt Disney studios. 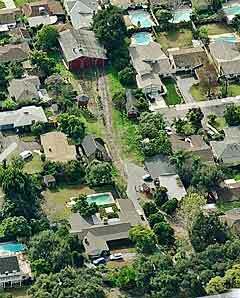 Originally built around 1942 in the orange groves behind Ward’s house in Southern California, the very-short line eventually was surrounded by suburban houses (upper left) until its close in 2006. What is less well-known is that the little road was an almost-perfect micro layout prototype, with an Inglenook track plan (below)! Joe Hall, from O’Fallon, Missouri, USA, tracked down those facts, so to speak, and drew up this tie-by-tie HOn3 plan of the 500-foot-long line in 66x12in (168x30cm). There’s a large amount of information available about the GFRR—here, for example, and here. 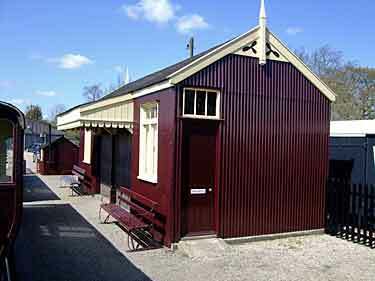 The buildings included a three stall engine house/storage shed and a small depot that had been used in a Disney film. Also on site were a small shed for a fire engine, a water tank and a windmill. 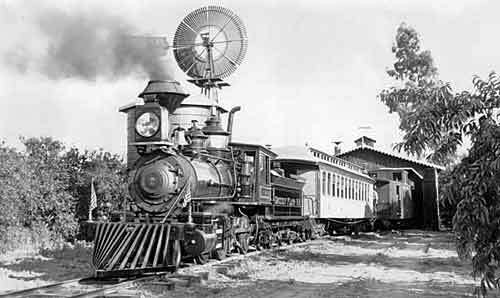 Equipment included Emma Nevada (upper right), an ex-Nevada Central steam locomotive, and Chloe, an 0-4-2 from Hawaii. There were also a passenger car and several other miscellaneous cars. 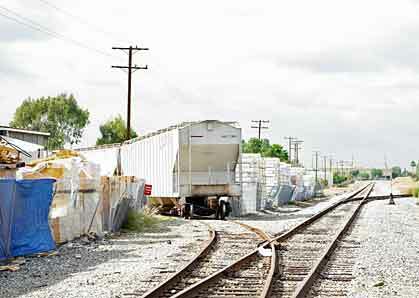 All of the equipment has now been moved to the Orange Empire Railway Museum in Perris, California, USA. Joe points out that modeling the Grizzly Flats should be relatively easy, as commercial models of the locomotives and the classic station have been available in several scales (the Pico G-scale station model is shown in the inset photo). A quick Google search will provide a lot more info. If you build one, please send photos! Steve Waterfield, from Staines, England was on holiday in early spring last year, when he discovered the Mid-Suffolk Light Railway. It was a nearly perfect example of the charm of Britain’s light railway lines, operating leisurely trains in beautiful surroundings for nearly 50 years (until closing in 1952). 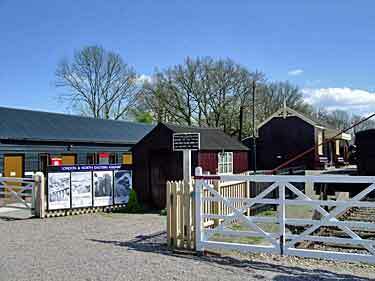 Steve comments, “A group of local historians and enthusiasts collected memorabilia and established a small museum on the site of an original station in 1990. 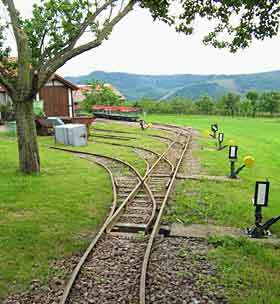 This has now grown to an operating museum line with about a half mile of track.” Steve took these excellent photos of the site and drew a track plan of the station. “As a minimum space model this is ideal. Each freight siding holds 4 to 6 short British four-wheel wagons; the station will handle two, possibly three six-wheel coaches with the loco; and the passing loop is in the same proportion. 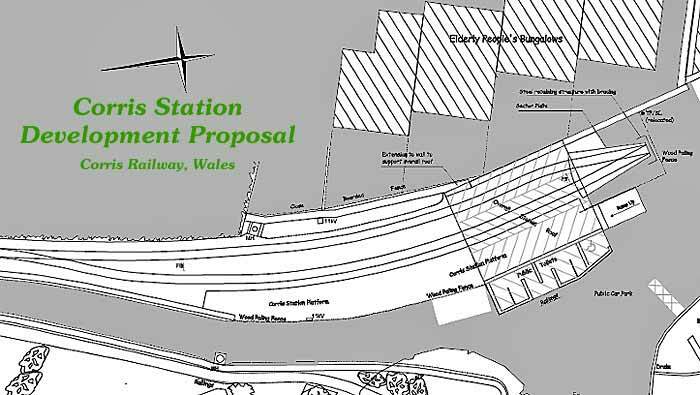 To do this accurately would require some kit building for the stock and scratch building of the station buildings. 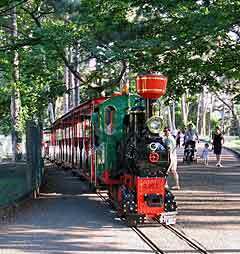 None of the original locomotives survived and the present one is a convenience, it worked on a docks system for many years before being restored, but is ideal for the rough track and sharp curve leading from the station. ” The MSLR web site is here. John points out that plastic pellet hoppers are 50% longer than conventional 40-foot cars, and the line is currently operated with genset locomotives. In the recent past it’s used SW1500s, GP38-2s (both UP and leaser), GP40-2s (UP and SP patch) and GP15-1s. Another prototype inspiration is the stop sign at the current end of track (below right). There’s a YouTube video here. 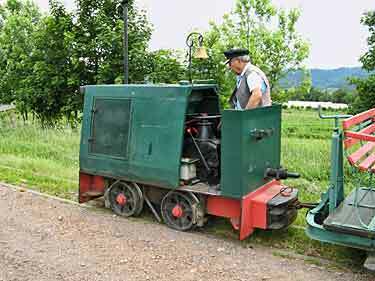 A couple years ago the Serrig Feldbahn, in Trier-Kernscheid, Germany, was “discovered” online, to the great excitement of narrow-gauge fans looking for good prototypes to model. 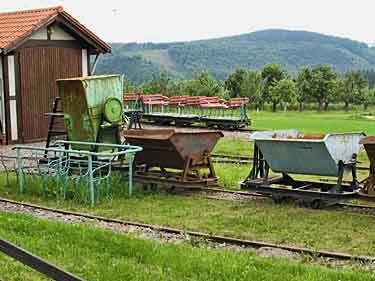 It is one of the last remaining winery railways in the Rhineland and boasts a number of unique pieces of rolling stock to handle the grapes. The line’s website has an extensive photo gallery of equipment and operations. This past summer, Scott MacLean, from Melbourne, Australia, visited the line on his holidays and found it not only thriving but serving an entire farm, including cowshed and piggery! Some of Scott’s photos are shown here as an update, and many more can be found in his gallery. Such space constraints also do wonders to help create excellent prototypes for micro layouts! 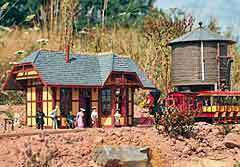 In the 1920’s, long before Ward Kimball began laying track in his California orange groves, W. C. Gage built and operated a two-mile backyard railway on his estate in Fishkill, New York, USA. It was a working 14-inch-gauge line, built almost entirely from recycled (“discarded”) materials, including 2×4 wooden rails. The car wheels and the locomotive’s gasoline motor were the only purchased parts on the entire road. 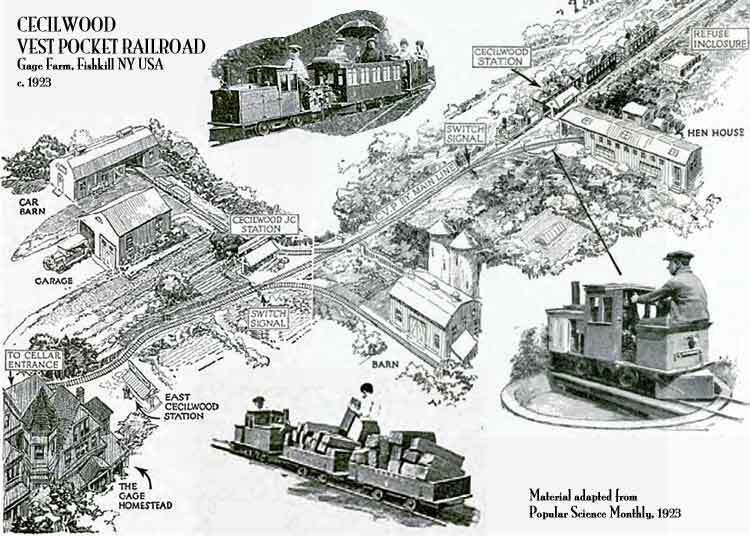 The illustration above shows the railroad’s trackage near the estate house. Would I ever! First, I noted that this was a working railway in addition to conveying a lot of tourists in its day. The road began as a way to haul ashes from the cellar of the Homestead house out to an ash dump half a mile away. Then the need to convey “farm products, fodder and fuel” prompted extension of the line for two miles! I decided to focus on the part near the house, where most of the action was, and produced the Gauge Farm Vest Pocket Railroad, an HOn30/OO9/HOe (9mm gauge) line in 24x21in. Although the impulse was strong to start with an oval, perhaps cocked diagonally in the squarish area, I figured that almost everyone would start that way, so decided to try for a more realistic, point-to-point plan. The result is a kind of “triple fishbone”, starting with a kickback into the cellar with sidings to the barn and henhouse facing in the same direction to simplify switching. The car barn serves as storage for the locomotive and rolling stock (including a snow plow) during inclement weather. Outbound trains disappear into the Fiddle track, representing the remaining 1.8 miles of line, where they’re turned for the return visit (a cassette would work well here). My only regret is that there’s not room for the little turntable by the henhouse… perhaps it would work on the spur to the car barn. 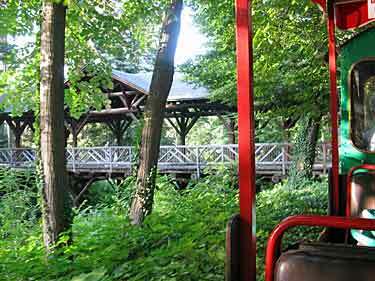 Benjamin Betgen, from Lyon, France, sent us a story about his local railway at the Parc de la Tête d’Or (Central Park), an island in the Rhone River. 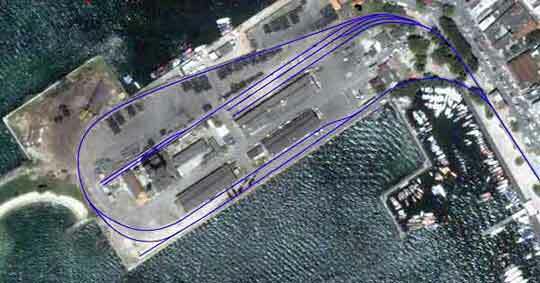 The track plan is a simple pizza oval following the water around the perimeter of the island amid lovely landscaping. 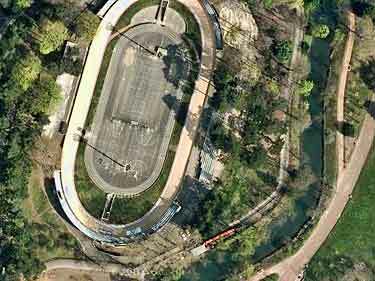 There’s a passing siding (loop) at the station with a train just visible in the lower third of the aerial view (below left). The rolling stock is garaged under the velodrome (bicycle stadium). The upper right photo shows the stock backing into its shelter. Ben’s two-year-old son loves to ride the train. Ben reports, “When he hears the whistle from afar, he immediately lets me know what’s to do: ‘Tchou-tchou MOI’!” Our kind of guy! What’s this? 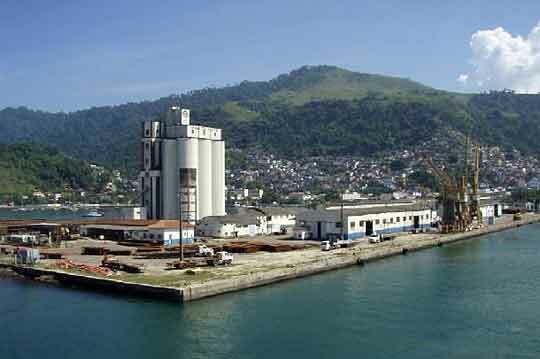 A lovely Brazilian port with a dockside that looks exactly like a model railroad—it even has square corners! 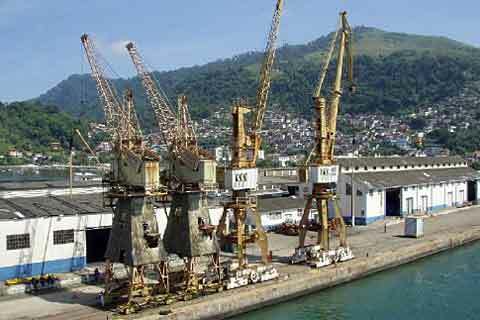 It’s at Angra Dos Reis, about a hundred miles west of Rio de Janeiro. 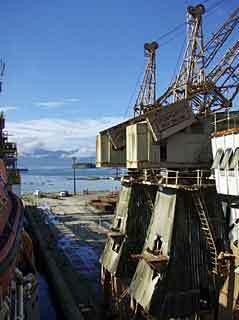 Jann Mayer, from San Diego, USA, photographed the port when the large ship where he was working pulled in for repairs. He shot from the ship’s helipad, at about the same angle as layouts are often viewed. 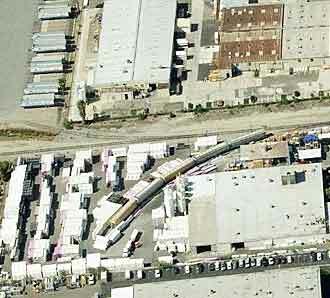 Later, he designed a very small layout to perform the same operations as the port. It’s a perfect setting, according to Jann: “Angra dos Reis is a small town that climbs up the ridge overlooking the bay, with the crowded main street forming a backdrop to the scene. 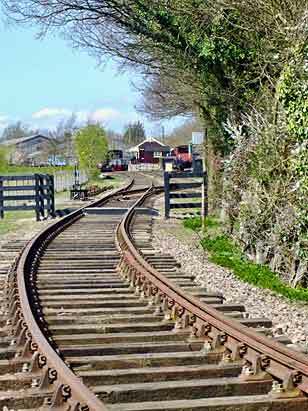 The track forms a simple reverse loop with a few sidings, offering good switching possibilities in a small area. 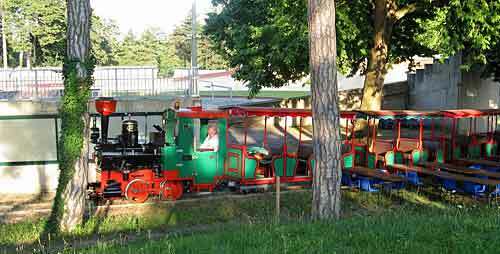 Between the port and the town, the tracks run through a park next to the inner harbor, which is typically full of colorful fishing boats. “I’ve drawn a version of this area in Nm using Z scale track in a space of 19x38in (48x96cm). Nearly all of the track runs through pavement, so none of the ties will be visible. [Because] the park and harbor scene was too good to pass up I used a ‘sector diorama,’ which is basically just a sector plate with scenery. The switching patterns of the prototype are retained while using only three turnouts. 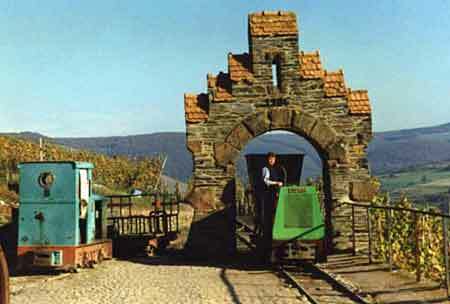 Corris Railway is a venerable 27-inch-gauge slate hauler that is one of the classic Great Little Trains of Wales. In 2002, after more than 30 years of reconstruction and struggle by a wonderful group of volunteers, the line was reopened to public passenger traffic. 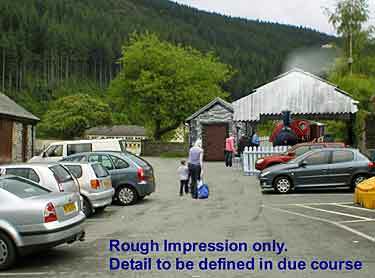 Now it is faced with a challenge caused by its own popularity: the terminal station at Corris is no longer big enough to accommodate the crowds. But the little line faces the same problem that many of us modelers do: lack of space! There’s no longer enough room to expand the facilities. Their proposal is startlingly similar to what we modelers do… they’re adopting a sector plate to shorten the space needed for a longer platform and loco runaround (above)! The new over-all shed will keep the frequent rains off the passengers’ heads as well (right). 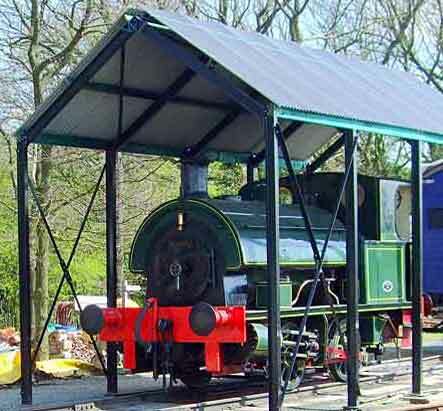 You can read the whole story with many more illustrations at the Corris Railway website. If your visit sparks thoughts of a way you can help the effort, that’s a good idea too. Thanks to Alan Cox, from Swansea, Wales, for drawing this remarkable parallel to our attention. The pictures show a different side of Provence, hidden away behind the glamorous facade. The military camp is behind the barbed wire at the right (above). 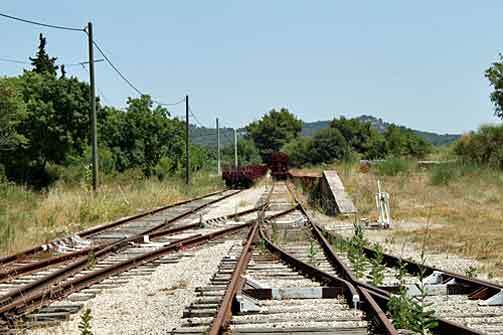 The railway track formation, however, with three switches tightly packed together, looks very useful. 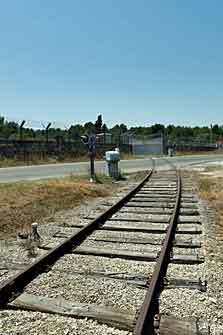 Facing the end of the line (below left), the main line is at the left next to the runaround track, and (below right) the spur ducks into the military installation through a gate.